President Donald J. Trump’s one-time chief strategist, Steve Bannon, noted in an interview with “60 Minutes’” Charlie Rose on Sunday that his former boss’ biggest legislative obstacles in Washington are members of the Republican establishment. “The Republican establishment is trying to nullify the 2016 election. 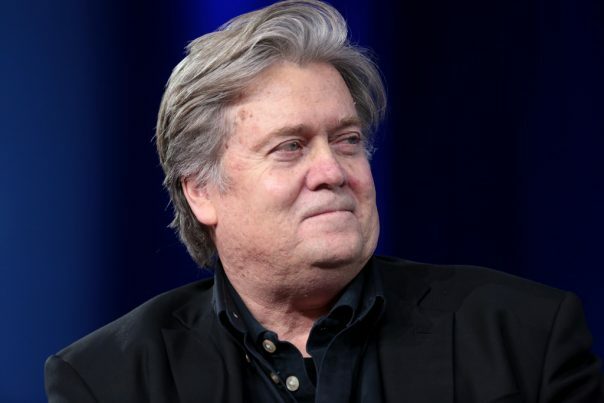 That’s a brutal fact we have to face,” said Bannon, who is once again heading up Breitbart News, in his first interview since leaving the West Wing. He also had little good to say about House Speaker Paul Ryan of Wisconsin and Senate Majority Leader Mitch McConnell of Kentucky. Bannon said during a meeting at Trump Tower shortly after Trump won the November 8 election, McConnell tried to convince the incoming team that talk of “draining the swamp” had to end. As for Ryan, Bannon faulted him and McConnell for failing to get an Obamacare repeal-and-replace bill to Trump’s desk for signature. “The plan was to do Obamacare because, remember, Paul Ryan and these guys come in and said, ‘We’ve done this for seven years. We’ve voted on this 50 times.’ … There is wide discrepancy in the Republican Party, as we know today, now that we’re in it. But I will tell you, leadership didn’t know it at the time. They didn’t know it till the very end,” he said. On the issue of the Russian “collusion” narrative that was cooked up by Democrats, their allies in the media, and even latched onto by some Republicans, Bannon said it was nothing but a side show. “There’s nothing to the Russia investigation. It’s a waste of time. … I think it’s far from conclusive that the Russians had any impact on this election,” he said. But Bannon also believes that the firing of former FBI Director James Comey was a monumental error, though he wouldn’t say whether he agreed with it or not. Calling it “the biggest mistake in [modern] political history,” the former chief strategist said had Trump not let Comey go, there wouldn’t be a special prosecutor probing the president’s finances today. “I don’t think there’s any doubt that if James Comey had not been fired, we would not have a special counsel, yes,” he told Rose. Bannon described [Special Counsel Robert] Mueller’s investigation into Russian meddling in the 2016 elections and whether there was any collusion with the Trump campaign as “directionally” very different from when Comey was leading it. Bannon also spoke frankly about immigration, and what the media and most everyone in Washington “gets wrong” about it. “I’m worried about losing the House now because of this – because of DACA … it will be a civil war inside the Republican party that will be every bit as vitriolic as 2013,” he said in regards to Trump’s decision to toss out President Obama’s executive order authorizing the program, very likely unconstitutionally. Too many Republicans are in favor of keeping it, which he thinks will bode ill for them at the ballot box in 2018. As for immigration in general, Bannon told Rose, “You couldn’t be more dead wrong [about immigration]. America was built on her citizens,” he said.